One of my favorite things about living in California wasn’t the beach or the theme parks (though those things were awesome) – it was my group of crafty girlfriends! We would get together every few months for a “Pinterest Party” and hang out, eat lots of yummy food, and just craft for hours. There is something about getting together with other people who love to make things and just visit and have fun! I wanted the party to be super simple and laid back, just a chance for everyone to make something they wanted. So instead of having a set project, I picked up some pre-made pallet signs from Michaels for our bases and put out paint, stencils, flowers, and the electric cutter machine! 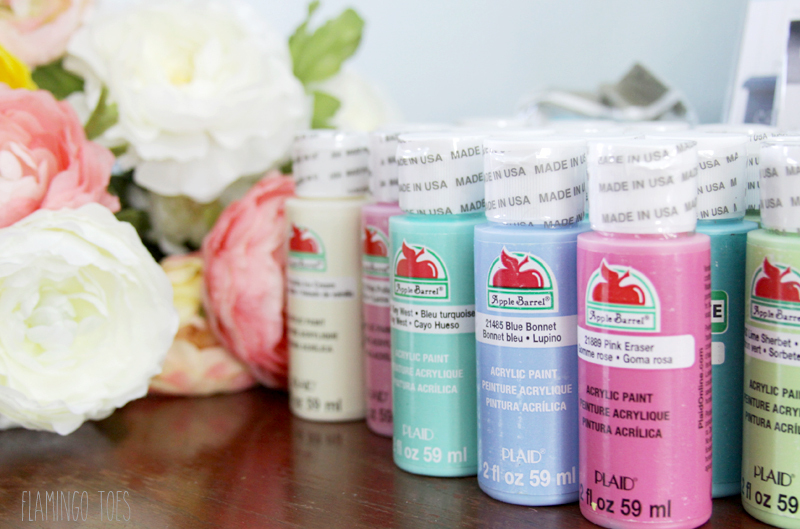 I used Apple Barrel® paints from Plaid for our craft paints. They come in sooo many pretty colors so we all had whatever color we needed for the project. It’s super affordable, I found a bunch at our local Walmart. I went with the Acrylic paint since we were doing pallet art, but it comes in gloss and multi-surface types as well. 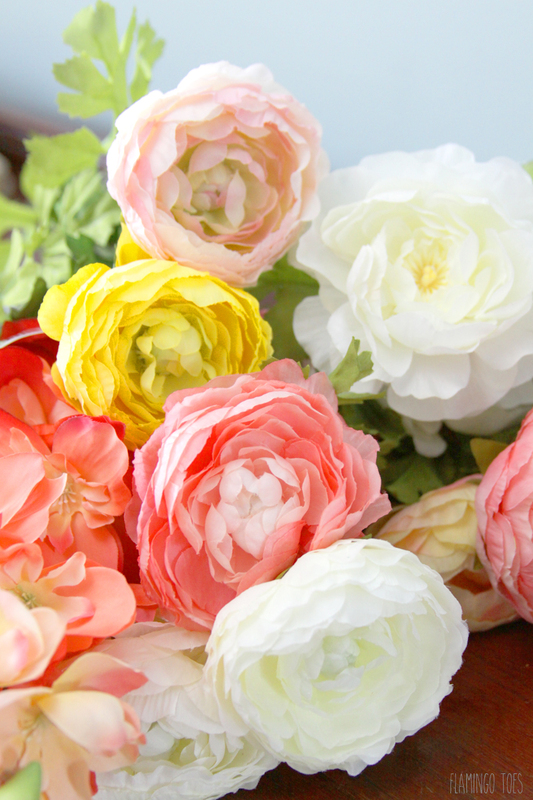 I also picked up some flowers from Michaels – they have such pretty silk flowers now and they look so realistic! They made great inspiration for those painting flowers. I think I’m going to make another sign and add some right to the wood, they’d be a great contrast with a stained pallet. Since my friends all wanted to do different projects, we cut out stencils and traced designs. It worked out great! I also had some unfinished frames for anyone that wanted to make multiple projects as well as lots of cute stencils from Plaid for decorating pieces. 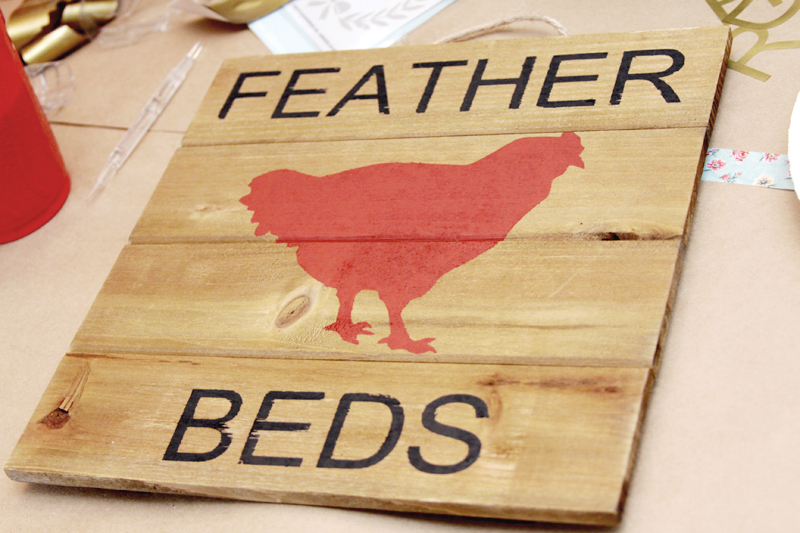 One of my friends is working on building a chicken coop, so she stenciled this darling sign to hang on the coop! It turned out so cute! 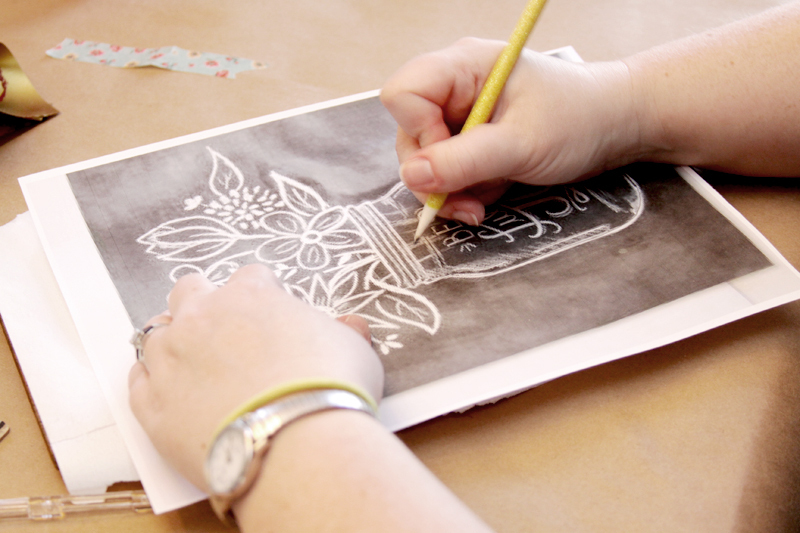 We had all sorts of projects going on at the same time – more stencils and some fun traced designs! I put brown Kraft paper down on my dining table – it protected the surface so no one had to worry about messes and it made clean up super easy! We used paper plates for palettes too! 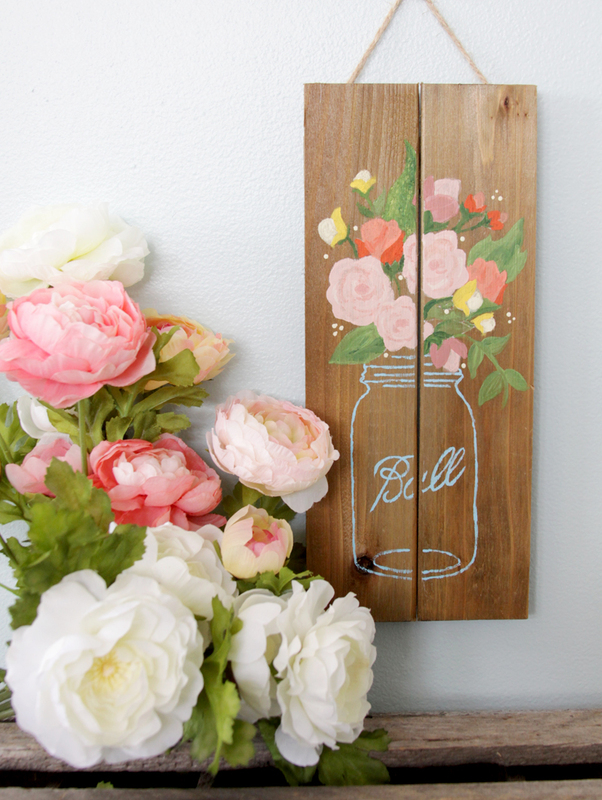 I wanted to do a mason jar design for my little farmhouse gallery wall! (I’ll show you soon!) 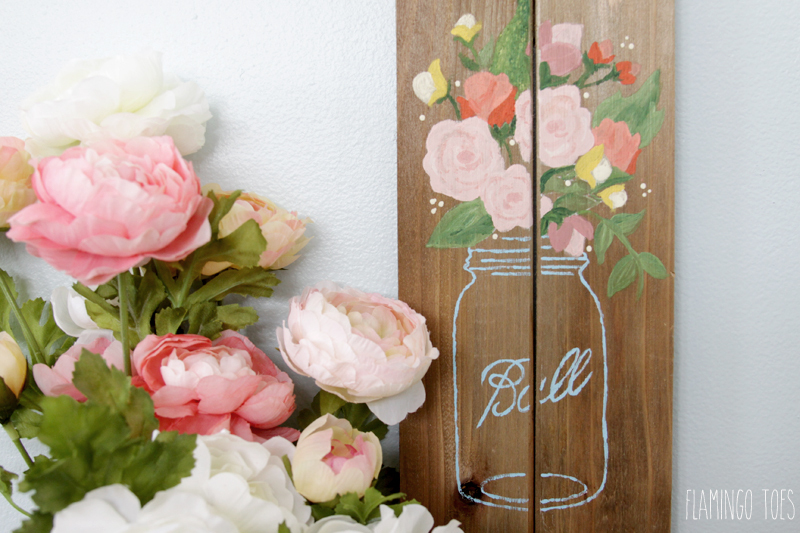 I found a design online and traced the basic jar, then painted the flowers using some online inspiration. :) I love how it turned out. Do you think I need to add stems though? I think I might. We had so much fun at the party! 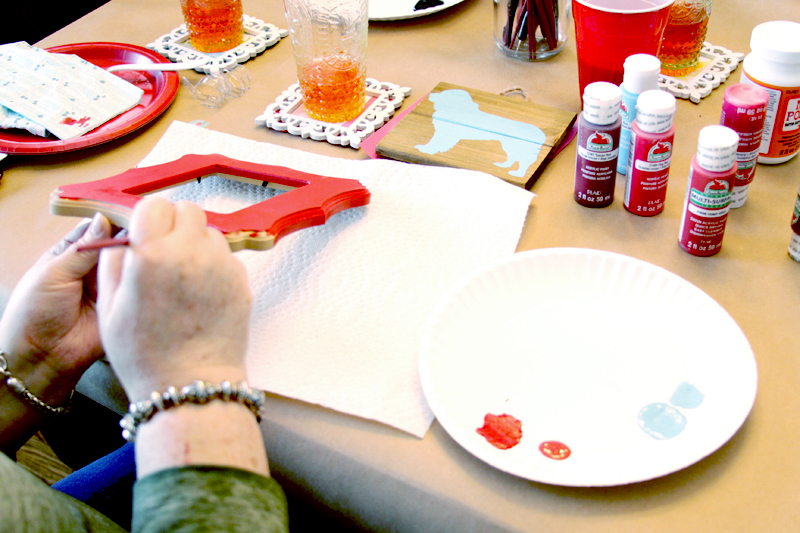 It was such a fun relaxing day – and the perfect way to celebrate National Craft Month! I can’t wait to do another day soon. 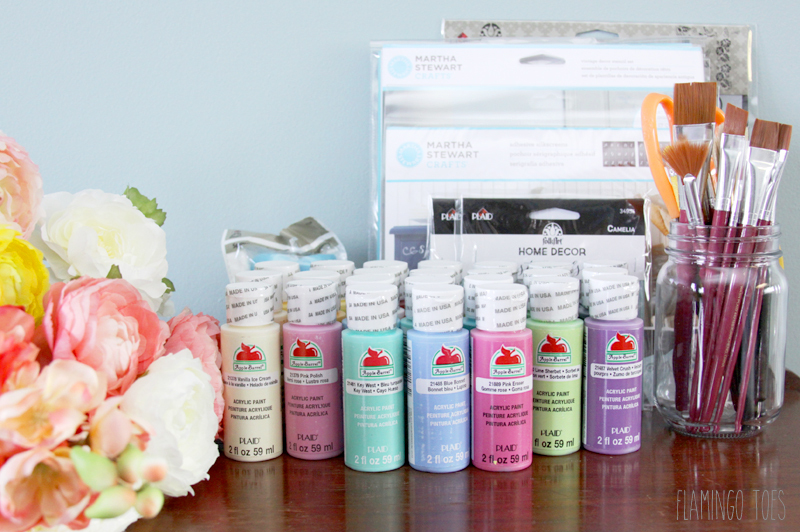 Do you have craft parties with your friends? If you’ve been thinking about it, I encourage you to go for it! It doesn’t have to be fancy or stressful or take a lot of planning. Just get together and have fun! You can find out lots more ideas and inspiration from Plaid – they have so many projects and supplies that are perfect for craft parties! I’d love to hear about craft parties that you have had – tell us about them in the comments! Love the pallet board art. Your “Ball jar” is gorgeous and you did a wonderful job on the flowers. That can be hung anywhere in your house to brighten a corner! Your pallet art is so beautiful! I love the way the pallet turned out, I have been seeing string art in the form of mason jars, really neat!! Going to check out Plaid, sounds inspiring! Do you charge for your craft parties and if so, how do you calculate the price per guest? 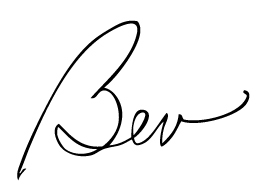 Bev, the project is really lovely! 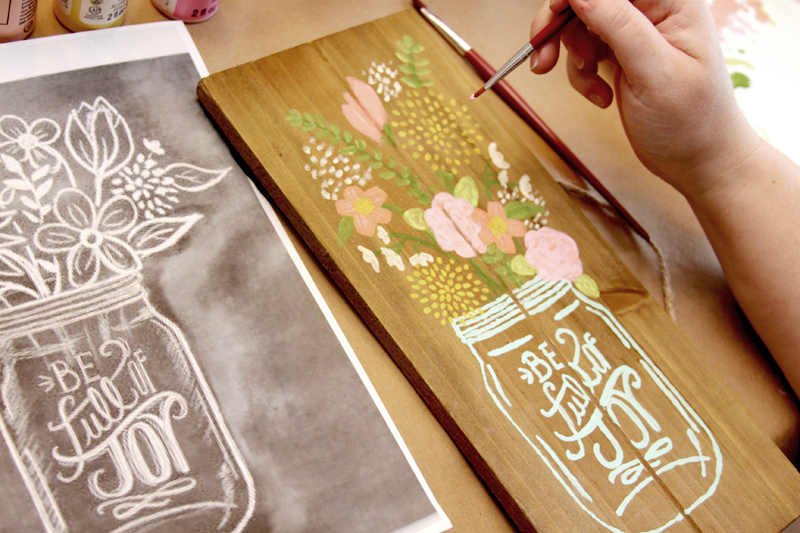 I never thought about stencils in this way! Thank you very much for the idea! Glad you had a party! We also have here – in December last time, and going to have one in April! Like it. Stems might bring the two (flowers and jar) together. 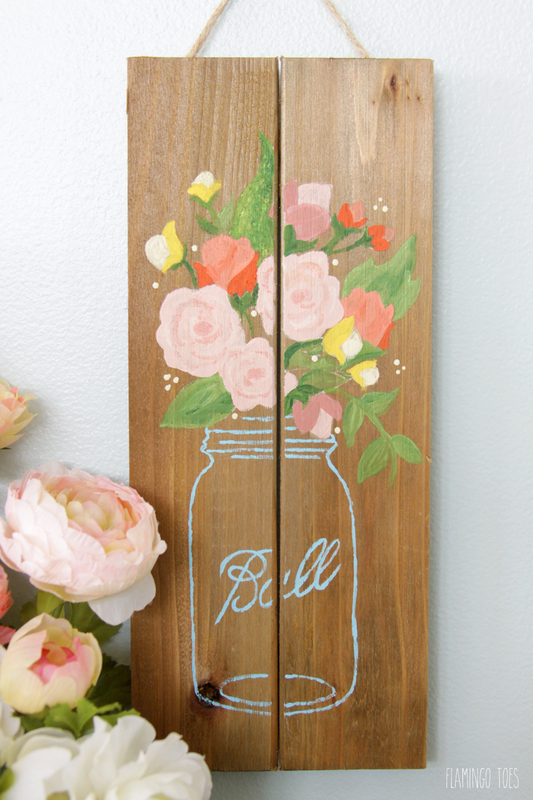 Wow, I want to come to a pallet painting party!! That’s so pretty! Is that a, “Be full of joy” stencil someone’s tracing? If so, is that one of the Martha Stewart ones you’re referring to? Wow!! I’m obsessed with this spring sign – you did a great job Bev! I’m def pinning this now. I have seen those pallets at craft stores and was trying to figure out what to do with one. A sign is a perfect idea. 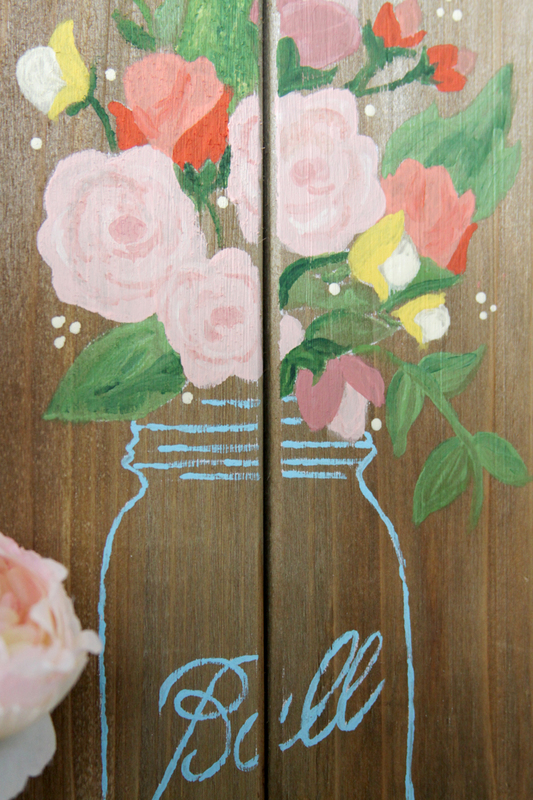 I was hoping you would have some secret stencil for those gorgeous flowers ;) I’m not sure I can paint that well haha. I might just have to try though because I love this! I’ve done a girls craft night before – they are so much fun. Last year we did one for spring where we made those pretty tulip wreathes. They turned out great! 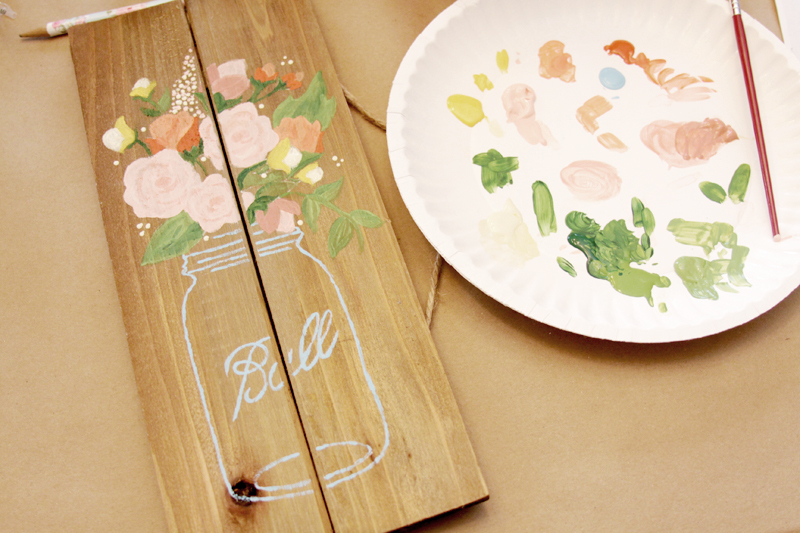 That would be so fun to go to a pallet painting party, maybe there could be one online. 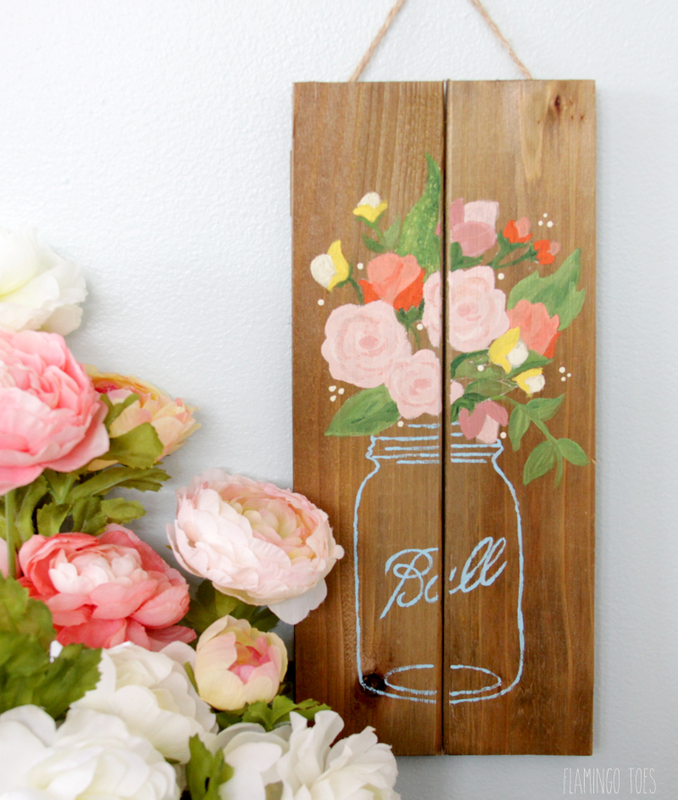 Your Mason Jar project turned out great, love the colors of the flowers, so spring!! THanks Bev for sharing on the #OMHGWW this week!! Hi Bev, this is just lovely. I appreciate seeing the steps too. Your floral bouquet looks just beautiful next to the natural flowers. Pretty project and I’m glad I popped over to take a closer look at it. Another amazing project, wow! thanks so much for sharing on craft schooling Sunday last week! Hi Bev, Hope you had a great Easter. Pinned & shared. Thanks for joining the Inspiration Spotlight party. How fun, I don’t have crafting parties but I would love to! What a fun idea! Thanks for sharing with us on Throwback Thursday! This is so much fun! I’m always hosting celebrations for my kids, but this would be such a fun celebration to host for my mom friends. Painting is sooo relaxing too… I can’t imagine a better way to spend the afternoon! Your finished pallets turned out beautifully too! 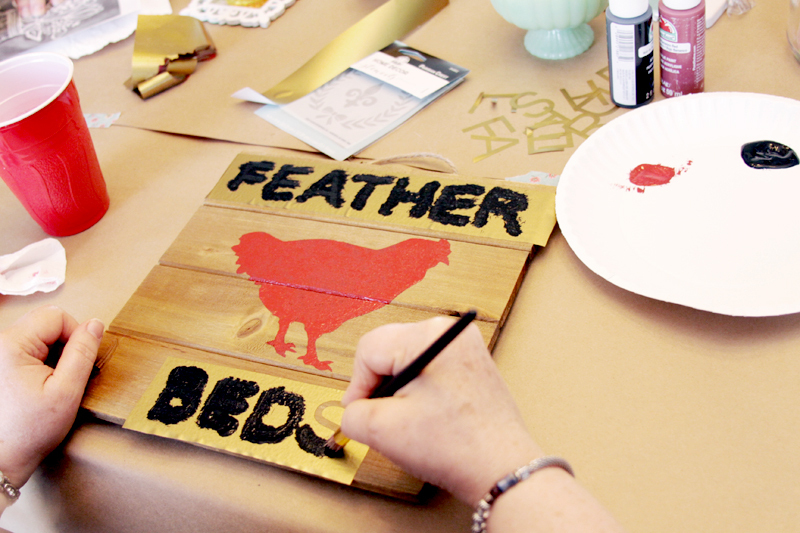 I love the idea of a pallet painting party! Yours turned out just gorgeous! I really want to make one of my own now! Thanks for linking up to the Handmade Hangout- I’ll be featuring you on my blog today when the new linky goes live at 6pm ET. I hope you’ll stop by and link up again! Just stopping by to let you know this awesome post was picked as a feature on the #HomeMattersParty. You can find it featured at http://adventuresfrugalmom.com/home-matters-linky-party-80/. While you are there make sure to grab the I was featured button for your side bar. Your work is gorgeous!! How did you trace the picture into your wood? ?